The efforts by neo-prohibitionists and cash-strapped state legislatures, like in Oregon and California, are not restricted to just the U.S. Across the pond in England, a similar tax hike is having a devastating effect on pubs, with over 2,000 closing since the taxes on beer were raised in 2008. There the beer industry launched a counter-offensive, creating an organization called Axe the Beer Tax. Recently, Axe the Beer Tax staged a protest outside the seat of Parliament at Westminster. Their anti-tax mascot, Mr. Pinty, and some friends, showed up to win support for undoing the beer tax and saving that most English of institutions, the pub. 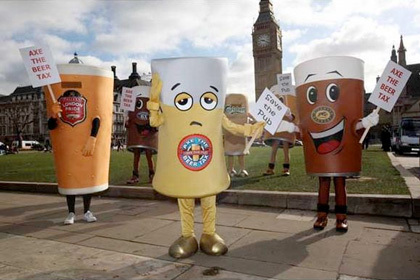 Industry efforts to stop further beer duty hikes in the Budget have been stepped up today with a parliamentary protest by a group of cartoon pint characters. The Axe the Beer Tax — Save the Pub’s 6ft mascot Mr Pinty was joined by five other characters representing beer brands for a march around Westminster and PR opportunity. As witnessed by The Publican, the group of five began their light-hearted protest at Parliament Square, as the Tamil protest continued on the other side of the square. They then moved on to the Treasury, handing out campaign postcards to bemused passer-bys, before heading for a photocall near Downing Street. More than 70,000 people have so far joined the campaign and 25,000 have lobbied their MP since November. As a result, over 202 MPs, from all political parties, have signed a parliamentary motion supporting the campaign. In the last week more than 10,000 people have sent emails and texts to the chancellor, urging him to scrap beer tax rises, according to the campaign. Mr Pinty said: “I am protesting with my friends today to make sure the Chancellor realises how horrible he is being to our lovely British pubs. The taxman already takes more than a third of a pint in tax and in the budget they want to take even more.